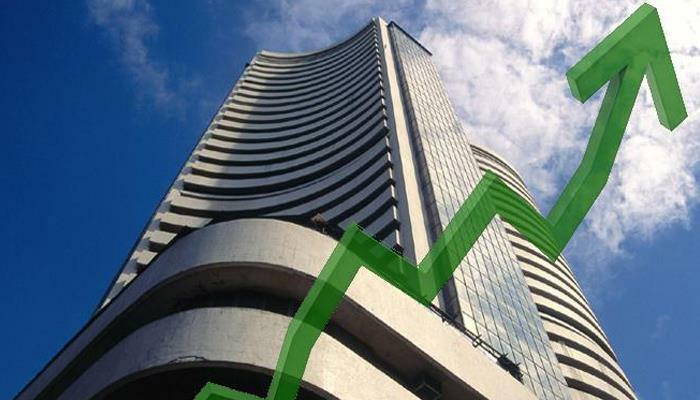 MUMBAI: The BSE benchmark Sensex on Wednesday rallied over 250 points on heavy buying in metal, IT and banking stocks amid positive cues from other Asian markets ahead of US-China trade talks and US Fed policy meet outcome. The 30-share index was trading 188.10 points, or 0.5 per cent, higher at 35,780.60. Similarly, the 50-share NSE Nifty jumped 51.55 points, or 0.48 per cent, to 10,703.75. On Tuesday, the Sensex ended 64.20 points lower at 35,592, and the Nifty edged lower by over 9 points to close at 10,652. In morning session on Wednesday, Axis Bank was the biggest gainer on both indices, rallying over 6 per cent after the third largest private sector lender Axis Bank Tuesday reported a 131 per cent surge in net income for the December quarter at Rs 1,681 crore boosted by a huge jump in recoveries from written-off accounts. Shares of ICICI Bank too rallied 4 per cent ahead of its quarterly results, scheduled to be released later in the day. Tata Steel, Yes Bank, Bajaj Finance, Vedanta, Tata Motors, Reliance and M&M were the other top gainers, rallying up to 4 per cent. While, HDFC Bank, ONGC, PowerGrid, Hero MotoCorp, Bajaj Auto, HDFC, Kotak Bank and HUL were the biggest losers, shedding up to 1.07 per cent. On a net basis, foreign portfolio investors (FPIs) sold shares worth a net of Rs 354.36 crore Tuesday, while domestic institutional investors (DIIs) were net buyers to the tune of Rs 81.27 crore, provisional data available with BSE showed. "With the interim budget set to be announced this Friday; expectation of the government breaching the fiscal deficit is high in order to boost rural sector," said Hemang Jani, Head - Advisory, Sharekhan by BNP Paribas. Market may take it in its stride even if the fiscal deficit target is breached by a small amount, provided that the government is able to convincingly back its actions with a push for growth-oriented policies and display its reforms orientation to be intact, he added. Global investor sentiment was positive, but the gains were capped as investors were cautious ahead of crucial talks crucial trade talks between American and Chinese officials on January 30 and 31. Market is also awaiting the outcome of the US Federal Reserve's meeting later in the day. Elsewhere in Asia, Hong Kong's Hang Seng rose 0.20 per cent, Shanghai Composite Index was up 0.09 per cent higher, Kospi gained 0.58 per cent, while Japan's Nikkei dropped 0.53 per cent in early trade. On Wall Street, Dow Jones Industrial Average ended 0.21 per cent higher on Tuesday. The rupee, meanwhile, was trading depreciated 21 paise against US dollar to 71.32. The benchmark Brent crude futures rose 0.44 per cent to USD 61.47 per barrel.